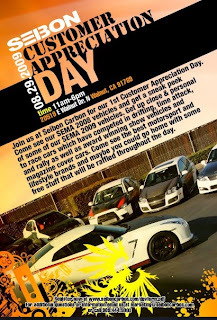 Seibon Carbon is opening up its doors for its first customer appreciation day August 29,2009 11 am - 6pm. Tons of drift, time attack, rally, and show cars are going to be on display including Seibons 2008 SEMA Show vehicles. 20159 E. Walnut , Walnut CA. Swing on by to check it out.